When a baby-tooth changes color, it can mean many things. Baby teeth can and do normally change in color, particularly close to the time that they become loose, however, this change is minimal and should not be confused with a carious lesion (cavity). The best way to determine if your child has a stain or a true cavity is to take him or her to a pediatric dentist. Caries is an infectious disease; it progresses if left untreated, and usually is associated with pain (especially when the 'cavities' are large). 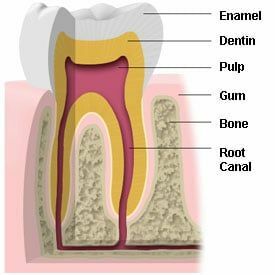 Teeth with cavities typically assume a darker (brown) discoloration, and depending on the extent, may exhibit loss of tooth structure. Teeth that have been previously 'bumped' may also change in color. Traumatized baby teeth can assume a yellow or a dark discoloration, which may or may-not be associated with pain. Other less common causes of changes in color may be: Fluorosis, food staining (particularly tea or colas), systemic disease (hepatitis), etc.